“Fellow equine advocates, I received this note, below, from Marjorie yesterday and wanted to share it as it is so very timely in so many ways. But being that it was personal I sought out Marjorie’s approval and just received said thumbs up, today. With all of the evil that stalks not only our wild equines but we Americans, even our faiths, worldwide this message is just as potent today as it was yesterday. Thank you Marjorie and bless you for “keeping the faith”. ~ R.T.
Today of all days, I am struck by the hypocrisy of people who want the wild burros gone from their rightful lands. On this day, Christ’s resurrection, I am reminded of the humbleness of the donkey, and his designation in the Bible as the animal that represents peace. On this day, I think of the Bible stories that tell of the many roles played by the humble, peaceful donkey in Christ’s life and times. Throughout the Bible and also other religious texts, the donkey plays a major role. In the desert there could be no greater partner than the donkey who can survive four days without water and acted as a water diviner when allowed to follow their instincts. The donkeys carried goods and people great distances while needing little to survive. Even now, scientists are tracking donkey fossils to determine the spread of human civilization around the globe for they were always the chosen beast of burden carrying goods afar in trade. Yes, we owe much to the donkey. Yet, the donkey asks for nothing in payment other than to be treated fairly. On the day Jesus was born a small donkey stood vigilant over the cradle of Jesus, and Balaam was warned by a donkey given speech to not betray the Jews. 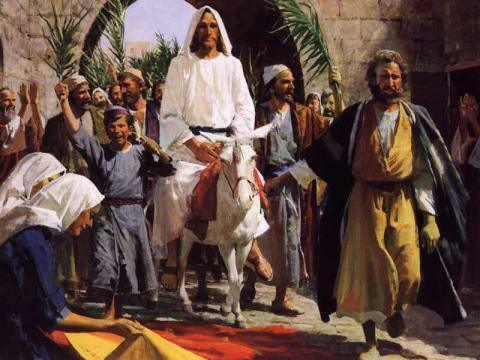 Then, on Palm Sunday the donkey rode into Jerusalem with Jesus aboard in a semblance of peace and servitude. Yet, now, everyday we read of violent acts committed against this kind animal. Jesus and God loved the donkey, yet today the wild donkeys are violently treated by hunters and game managers who call them pests and vermin. These same people would most likely identify themselves as Christian without seeing the hypocrisy of their actions toward their own religion as they ask to remove donkeys by whatever means possible. They ask to issue hunting permits, and issue roundup orders. They ask to send these sublime animals given as a gift to all of us, to slaughter. It hurts my heart. Greetings Ms. Farabee, Thank you for this beautifully written essay that relays Holy Bible scripture about God’s creature, the donkey; it is my prayer that mankind will once again honor this member of the equine community. Very moving, and I hope people in government will listen and take heed. Beautiful! The innocent, the humble, the donkey. Marjorie, your gentle words mirror my own exactly. There is no justification anywhere for the persecution of wild burros and horses. If I was going to explain the word “friend” to someone, I would have to include in my explanation, Ms. Marjorie Farabee and burros. Very on point, I am going to light a candle tonight for those who served from Biblical times. What a journey they have come on.